সে ঢেউ এর মত ভেসে গেছে..চাঁদের আলোর দেশে গেছে….. I wish we can have only good memories in our life! I wish! I wish! I wish……I wish we can have our closed ones with us forever… This is what we can just wish for…. Life is about both creation and recreation….This is probably for the first time I am writing with a pain in my heart here in DR! For not able to meet her when she was alive! I never met her, but she was known to me… she was married to one of my good friend… She was part of my and her hubby U’s discussion so many times… but don’t know why I and she never met! U was fascinated by her… she was the person who made “U” a dignified person; she was the reason of every success that “U” achieved in his life and for “U” love means “She”… their story is like a real play of Erich Segal’s “love story”…. I still remember those days when me and “U” used to discuss about our respective partners during 2008-09…They were married then and we were in a phase to plan our marriage.. Somehow, me and “U” was not able to be in touch after that as we both were busy with our respective life and finally had a chat after many years in 2014… He wrote me to congratulate for Pasta’s birth and I asked about their plan and then “U” told me that she was diagnosed with Cancer; next few months passed like anything and “U” lost her in 2015! “U” never told me that she used to read my blog in her last days… she used to cherished my writing….He told me today…after so many days….and I have nothing to say but to write to just to dedicate this to her… My real-life Love story girl… This post was planned for Bijaya Dashami since it is all about Chandrapuli a bong sweet! A sweet that depicts Bijaya Dashami…a day with a pain of not having Maa Durga for the next one year with an expectation of her return to our life… Maa returns every year but not the human who left us…This is to celebrate my dear friend; her passion; her life… a sweet for the Sweetheart “P”…. Life is about construction and reconstruction and I know you are there…somewhere in the “chander alor desh” and probably reading this….Recipe will come as part of this post for sure… to dedicate you. I don’t know how far I am right to share this but I just can’t help it but to write! A sweet that was planned for Bijaya Dashami and I made it too! Chandrapuli is what I have planned for this year’s Dashami! 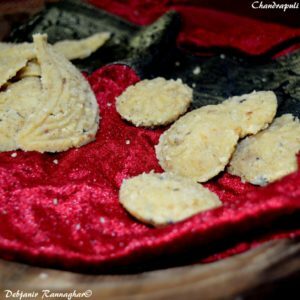 There is a unique relation between Sweet and the last day of Durga Puja! On the last day of Durga Puja Maa Durga left us for one whole year and probably to cut down the pain we celebrate with having sweets on that day! We used to serve with this traditional sweet made up of Coconut and Khowa on the evening of Bijaya Dashami by the elders after completion of Bijayar Pranam. 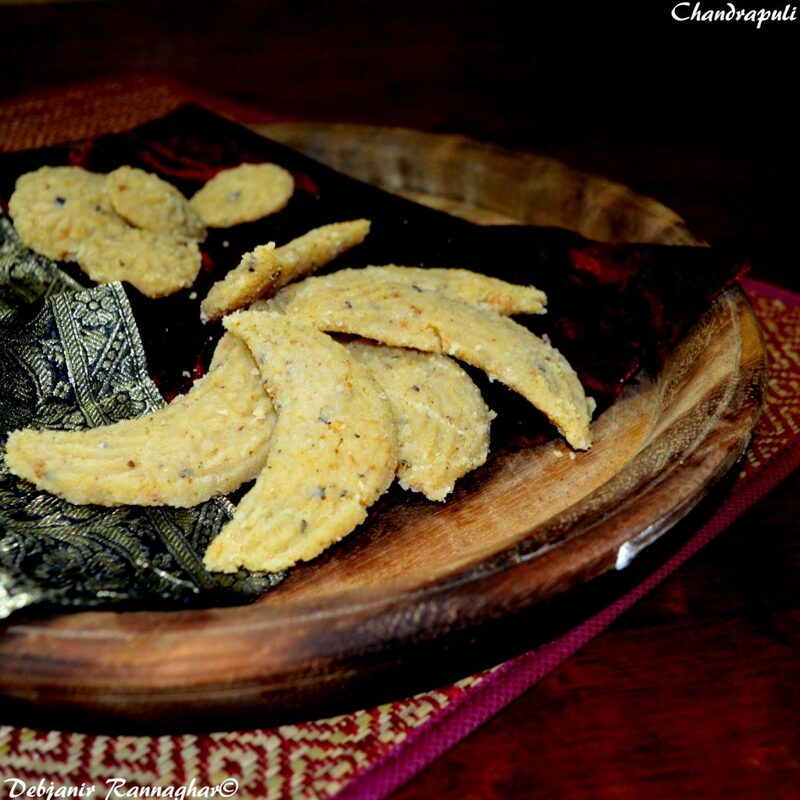 Few variations were also there that includes Narkel Chapa (a round coconut sweet), Narkel Tokti ( a diamond shaped one) and last but not the least Chandrapuli, the half-moon shaped. There was a sweet shop nearby my house” Laxmi Narayan Mistanna Bhandar” (is still there) where a yellow coloured Chandrapuli was available while in Bhim Nag and other reputed Confectioner’s shop colour of the sweet is mostly off white or white. Chandrapuli is a traditional Bengali sweet prepared with grated coconut and solidified milk i.e. Khowa with a pinch of Camphor or Karpur! In fact camphor makes this sweet special with a unique aroma in it. I never ever thought of preparing Chandrapuli at home but found a very cute half-moon shaped mould which is not typical Chandrapuli mould (D shaped) but a proper half-moon and I have decided to use it to make Chandrapuli. Since I have round moulds available with me, I made some Narkel Chapa as well! Clarified Butter/ Ghee: 1 Tsp. Separate Cardamom seed from the skin and make a powder of green Cardamom. Grate Khowa and keep that aside. Grate Coconut using a coconut grater and then make a paste of the grated coconut using the dry jar of the mixer grinder. Now take grated Khowa in a deep bottom pan (preferably non-stick) and start cooking in medium flame until Khowa melts completely for around 3-4 minutes. Stir continuously to avoid sticking khowa in the bottom of the pan. Add Sugar to melted Khowa and keep stiring to melt Sugar as well. This will take around 5 minutes in low flame. Add grated coconut in this stage along with Green Cardamom powder and ix properly. Add powdered Camphor to the mixture and keep stirring till the mixture thickens and leaves the edges of the pan after around 7 minutes. Flame should be lower while cooking. Now take the mixture in a plate and allow it to cool for 10 minutes. 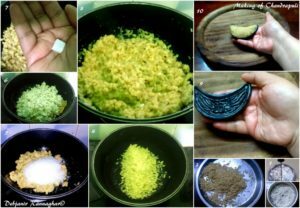 Take little Ghee and apply on the Moulds and take around 2 Tbsp. 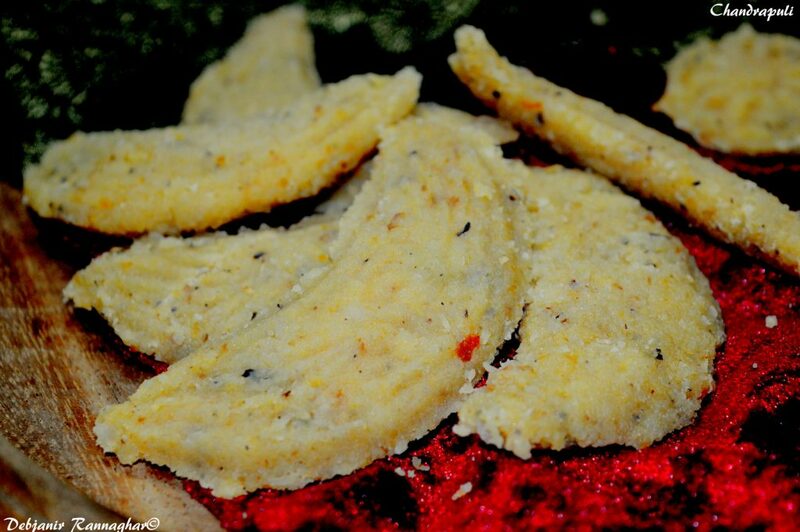 mixture and by pressing with the fingers on the mould make Chandrapuli and give it a shape of half-moon. In case not available with a mould shape Chandrapuli using your hand. Make remaining Chandrapuli as well. Last but not the least, let us celebrate our precious life; our relations with conscious effort! Life is precious and so relations are! I was listening to one of my favourite Rabindrasangit while writing…… “আমার প্রানের পরে চলে গেল কে!” Just thought to share the Youtube link with my readers! 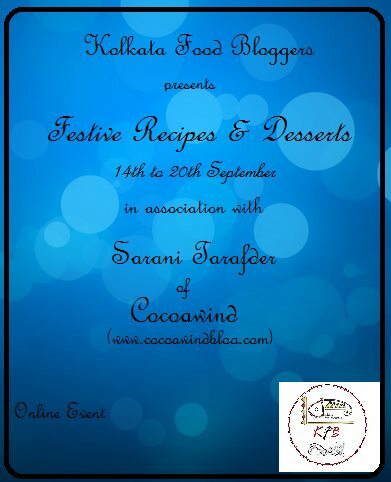 I am sending this to the “Festive Recipes and Desserts” event by Kolkata Food Bloggers where Sarani who writes at Cocoawind is the featured blogger!.